As people age, they have to contend with the passing of close friends, siblings, and spouses. 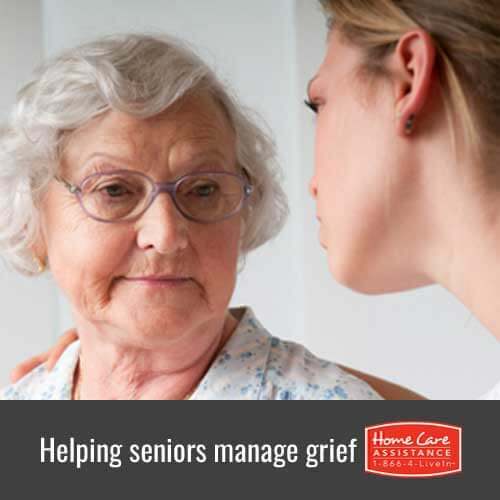 Working through the resulting grief can be challenging, especially given seniors are forced to confront their own mortality in the process. If your elderly loved one is in mourning, here are some ways you can help offer the consolation and support he or she needs during this time. Memorials and funerals are typically held when grief is fresh and those closest to the departed are still in a deep state of shock. Although one of the primary purposes of holding a memorial is to honor the deceased, these occasions tend to be somber and even depressing. Moreover, the pain of a recent death can last far beyond the actual occurrence of these affairs. If your loved one is still grieving several weeks or months after a funeral, consider hosting a lighthearted family dinner so everyone can come together and discuss the life and accomplishments of the departed in a positive way. It isn’t possible to pull someone out of the grieving process before he or she is actually ready to move on. People have to mourn in their own way and at their own pace. Honor and acknowledge your loved one’s need to grieve by offering a shoulder to cry on and lending a sympathetic ear when necessary. Much like death, grieving is a normal part of life and people should be given ample space and time to express their emotions and adapt to this major change. Talking about time spent with the departed or telling stories about past events can help your loved one work through his or her sorrow. Grief is a highly personal experience, and although many people can quickly adjust to the death of a close friend or family member at a textbook pace, others have a harder time getting over their sorrow. Make sure you continue to check in with your loved one even after several weeks have passed, especially if he or she is living alone. Keep in mind that after a spouse has passed away an elderly adult may need to consider new living arrangements or seek companionship care from an Oakville home care agency. Adjusting to life without a spouse or close friend can be difficult. Grieving seniors are at high risk for experiencing social and mental health problems like severe depression, anxiety, and isolation. Make sure your loved one is never spending too much time alone. Fear of becoming burdensome or losing independence could be preventing your loved one from reaching out for help and support at a time when it is most needed. Check in regularly and openly express your willingness to provide any help that is required, and consider hiring a part-time or 24-hour caregiver in Oakville to provide companionship and additional assistance. Losing someone close is never easy, and every senior will mourn in a different way. However, many seniors will benefit from the companionship a professional caregiver can provide. If your loved one is grieving and needs someone to offer emotional support, the caregivers at Home Care Assistance are available 24/7 to help. We also offer specialized care for a wide variety of complex needs. For more information on Parkinson’s, Alzheimer’s, and dementia care Oakville families trust, call one of our qualified Care Managers at (519) 590 2792.